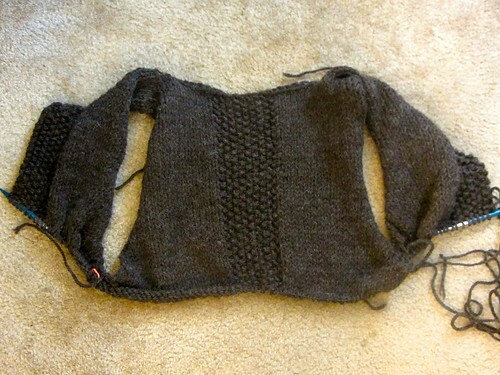 Wildflower Cardigan off the needs and blocked! My current solution is to pack my sweaters around until I visit a friend I can beg to take some pictures. Meet the completed Wildflower Cardigan by Alana Dakos. The pattern is available individually through Ravelry, but it’s also part of the book Costal Knits which is full of gorgeous patterns. This is the first sweater from the book I have knit, but I could see myself wearing all of them! I think the pockets are so darling! They’re not going to be much use for actually storing anything, but I love the little flower. The detail along the hem is pretty sweet also. It does curl the tiniest bit though, so if you are the type of person who is bothered by things like that, think twice. Watching it curl while I was knitting, I was worried it would be really bad, but it’s just the slight curl you see in the corner of that photo. 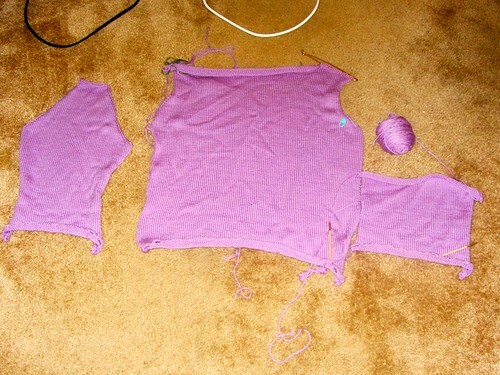 The yarn I used is Cascade 220 Superwash Sport and the color is Wisteria. I bought 12 skeins, but only ended up using a tiny tiny bit of the 9th. Like, all I needed from the 9th skein was a few yards to finish the side seams. I was pretty loose with my ends because I knew I had extra, so if I had been more conservative, I’m sure I could have squeaked it out with just 8 skeins. 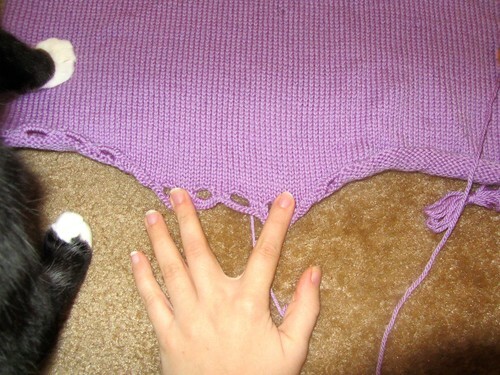 The gauge listed for this pattern is very tight for a sport weight yarn (28 stitches to 4 inches.) To get that gauge, my fabric would have been bullet proof. I liked the fabric I got with size 5 needles, so I basically followed the instructions for the 36″ bust knowing that because my gauge was bigger I would end up with about a 40″ bust. It came out pretty much perfect. When I showed the sweater to Bob he said: “You would think that it would look frumpy, but it doesn’t.” I think that’s a good note to end the post on.